I'm always impressed by a well dressed man. 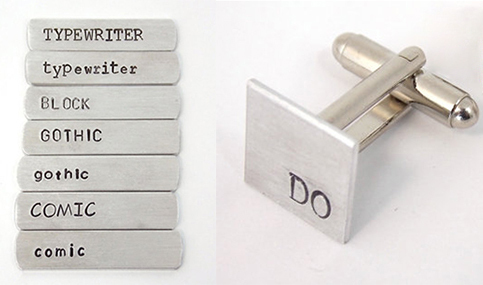 So when I saw these handsome cuff links by Dean Olaya of Block and Hammer in Atlanta, I was an instant fan. They add that nice final touch to a manicured outfit. Dean runs this shop along with his girlfriend, Lauren Miller out of their home office in the Grant Park section of Atlanta. They started the shop after a need for a fashionable pet tag and without any luck, Dean decided to make the tag himself. (they no longer sell pet tags but check out Fetching Tags if you're in the market for one) The Block and Hammer shop now offers a variety of manly accessories, including three styles of cuff links. The first two are aluminum or copper. As Dean has mastered the art of stamping with a 'block and hammer,' either style can be personalized with initals, an icon or short phrase. Their third style of cuff links may be my favorite. Each of these sets of wooden cuff links are one of a kind, finished by hand, offered in walnut, shedua, cherry or oak. Dean, "I love spalted wood varieties because each piece is so unique and has so much character." I like Dean and Lauren's passion to create stylish, affordable accessories for the modern man. As Dean shared, "They hit a reasonable price point that makes them easy for gifting and won't hurt your wallet." Check out the Block and Hammer shop to see all the manly offerings which include tie clips, collar stays and luggage tags.